In my home, cookies trump cleaning. Lately, I’ve been thinking that the chocolate portion of this blog has been neglected — not for lack of eating my favorite food, but because I’m eating it too quickly. And, well, once out of sight, out of mind. 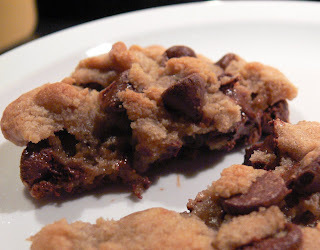 But I’ll try and make amends by sharing my favorite chocolate chip cookie recipe. Okay, okay, I know I’ve said that before, but my faithfulness is fleeting and mostly I like whatever is in my hand. As I’ve cooked up batch after batch of these cookies in the past few weeks, a fine sprinkling of flour has settled on top of the existing thick layer of dust in my kitchen. For you see, although I revel in the results of spring cleaning — a sparkling home scrubbed free of grime and smelling like sweet grass — it doesn’t inspire me to action. But these cookies do, so perfectly balanced, crisp and chewy and loaded with warm, bitterwsweet chocolate. And I’m excited about a few other things too, all of which don’t require rubber gloves, scrub pads and buckets of soapy water, but go quite deliciously with cookies. Check out “What I’m Loving” at the top of the right-hand column. Melt butter. Mix butter with sugars, salt and vanilla. Add egg and egg yolk. Stir in flour mixture. Stir in chocolate chips. Form dough into large balls (about 3 tablespoons) and place on a greased cookie sheet. Bake at 375 for 10 to 14 minutes or until golden brown and still puffy. Edges will be set, but centers will be soft. Anna just made these and we're all in Heaven, perhaps Jack most of all. We were able to do it with only minimal ingredient substitutions. Thanks. Muchos besos!! Glad you love them. They're my go-to recipe for chocolate chip cookies.